Are You Suffering From the Wallenda Factor? Consultants and coaches will refer to the "Wallenda Factor" when warning people about how fear can impact performance. It's a reference to the famed Karl Wallenda. In 1978 he fell 75 feet to his death while walking a cable strung between two hotels in San Juan, Puerto Rico. Later, his widow wondered if a fear of falling contributed his falling. It was an anxiety Karl had never known before, but his widow explained that months before his fatal stunt the performer had become convinced he was destined to lose his balance and plummet. His timid precaution that resulted from this terror may have compromised his performance, and thus his fear of falling became a self-fulfilling prophecy. Apparently Roosevelt was right: We really have nothing greater to fear than fear itself. That's why I'm so impressed with King Hezekiah. When the young man began his reign over Judah at the age of 25, the formidable Assyrian war machine threatened his tiny nation. He had every reason to fear, and yet he demonstrated a rock solid trust in God. Instead of the poor decisions that panic often produces, Hezekiah made wise decisions. And God's responding deliverance of Jerusalem is one of the most dramatic miracles in the BIble. 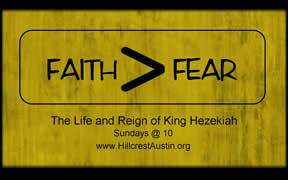 We begin a four-week study through Hezekiah's reign this week. The series is called "Faith>Fear." Join us at 10! Thanks to all who made the "Winning Ways" Banquet a success! Jay and Dee Simpson raise BBQ to an art form, Amy Karm and the orchestral ensemble did a beautiful job, and Melissa McKanna touched our hearts. Thanks to these folks and to everyone else who played a role in this great banquet! I want to add my thanks to my assistant, Jami Dismukes, for her always-thorough help on this and every other project. The Anchor Course starts February 10. If you are exploring faith or trying to explain your faith to others, the Anchor Course will help. It's an 8-week study through a book I've written about the basics of Christianity. Consider it a sort of "tour guide" for our faith. Join me on February 10 at 5:30pm for a "no obligation" introduction of the study. If you decide to sign up for it, you'll get your free book on that night, and then we'll meet every Sunday for 8 weeks at 5:30pm. More information is available here.